Why should we study glaciers that no longer exist? And why should we examine the sediments left behind? We currently cannot predict the future behaviour of glaciers and icefields with much certainty because our records of glacier change are limited. But changes to the World’s ice sheets will have a huge impact on our own future – shrinking icefields threaten water supplies, whilst the meltwater they produce puts the lives of downstream communities at risk of catastrophic flood, and contributes towards sea level rise. To better understand and predict how glaciers respond to climate change, we can look at the geological record. By examining sediments deposited by former glaciers, we can discover important information about the history of the Earth’s surface. Yes, the famous scientist, with whom we all associate the foundation of evolutionary biology, once visited the western Scottish highlands and made some interesting comments on the geology of the region. He stumbled across a peculiar valley with three unusual ‘Parallel Roads’ along both sides. In the 18th and 19th Century, the Parallel Roads of Glen Roy presented one of the greatest geological mysteries: how had three parallel roads been etched onto the valley sides of Glen Roy? The Parallel Roads of Glen Roy. Note the three horizontal markings in the valley sides. Images: (left) in the public domain, (right) used under a creative commons licence from Wikimedia Commons. Their definition in the landscape suggested human intervention, and some highlanders once believed the roads to be the work of Fingal, the Celtic King. These roads also puzzled the minds of many Victorians, who believed the three roads were obsolete highways, with one for livestock, one for horse drawn carriages and one for humans. In fact, the Parallel Roads are the work of a natural phenomenon, which attracted interest from a young geologist by the name of Charles Darwin, who had seen similar features in Chile whilst on The Beagle voyage. In 1838, Darwin suggested the roads were shorelines caused by marine processes, and proposed that Glen Roy had once been inundated by sea water1. But the true cause remained contentious, and in 1840 a Swiss geologist named Louis Agassiz contradicted Darwin, suggesting that the roads were actually formed by freshwater (lake) processes2. At the time, Agassiz was developing a controversial theory that only a few thousand years ago, much of Europe had been covered in ice. He believed that this ‘Ice Age’ could explain the Parallel Roads of Glen Roy, and suggested that advancing ice blocked the natural drainage systems of the River Roy, forcing the lake levels to rise. The initial geological research of the late 19th Century, and subsequent extensive surveying and landform mapping in the 1970’s3,4,5 confirmed that Glen Roy was influenced by glacial ice between 13,000 and 11, 500 years ago. If Glen Roy was indeed once under 300m of cold, glacial lake water, what kind of mud accumulated on the lake bed? Are these sediments still present in the Glen Roy valley, and how long was the entire valley an ice-dammed lake? The recent discovery of a unique type of glacial sediment6,7 confirm that Glen Roy was once a glacial lake that existed for about 500 years. These sediments are deposited in layers through the year, much like tree rings observed in a tree trunk. They are formed in lakes at the front of glaciers and we can learn much about the speed of past glacial change by looking at these layers, known as varves. Did you just say varve? What is a varve? 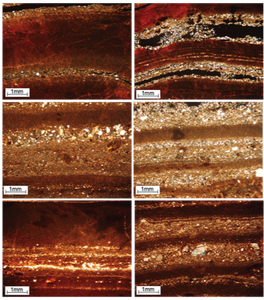 Varves are one of the most important sedimentary types for illuminating past climate change. Varve is a Swedish term referring specifically to a type of sediment or sedimentary rock with layers relating to one year of sedimentation. In glacial lakes, a varve contains at least two layers: one deposited during the summer; and one deposited during the winter. Thus, when combined, these two layers constitute a single year’s worth of sediment ie: a single varve. Glen Roy varves under a microscope. The light coloured layers represent the summer season and the dark layers represent the winter. Image by Rachel Devine. In extremely cold environments, the lake surface is frozen during the winter, so the waters cannot mix, and finer material settles to the bottom of the lake forming a clay layer. 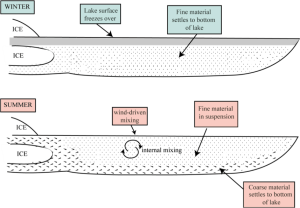 In summer, the lake surface melts, allowing surface winds, internal currents and inflowing streams to mix the lake waters and keep fine material afloat. Coarse material then sinks to the bottom of the lake forming a sand/silt layer, which represents the summer season. Now we know what varves are and how they form, how important are these layers of mud and what can they tell us about the environment of the past? The presence of varves tells us that glaciers were present in Glen Roy and that the climate was cold; the number of varves tells us how long this cold phase lasted. The thickness of the layers can be determined by different factors, such as the duration of the seasons or the climate during that year. For example, an extremely thick winter layer could mean an abnormally prolonged winter, or a thick summer layer could mean that the summer experienced high rainfall, eroding lots of sediment into the lake. Varved sediments have enabled scientists to view a snap shot of the past climate in Scotland at the end of the Last Ice Age, which had not previously been possible in this region. So, it seems although Darwin felt he had made a bit of a blunder in Scotland, in thinking that the sea had formed the shorelines, the ‘culprit’ was actually something that no longer exists in the Scottish landscape – glacial ice – which has left behind an annual record of its dynamic nature in the ‘mud’ it deposited. Darwin, C. R. (1839), “Observations on the parallel roads of Glen Roy, and of other parts of Lochaber in Scotland, with an attempt to prove that they are of marine origin”, Philosophical Transactions of the Royal Society 129: 39-81. Full text. Agassiz L. 1840. On glaciers, and the evidence of their having once existed in Scotland, Ireland and England. Proceedings of the Geological Society of London 3: 327–332. Full textvia Google EBook. Sissons JB. 1979b. The limit of the Loch Lomond Advance in Glen Roy and vicinity. Scottish Journal of Geology 15: 31–42. Full text. Palmer, A. P. & Rose, J. 2008. Microfacies analysis of laminated sediments in Glen Roy and Glen Spean. In: PALMER, A. P., LOWE, J. & ROSE, J. (eds.) The Quaternary of Glen Roy and vicinity, Field Guide. London: Quaternary Research Association. Palmer, A. P., Rose, J., Lowe, J. J. & MacLeod, A. 2010. Annually resolved events of Younger Dryas glaciation in Lochaber (Glen Roy and Glen Spean), Western Scottish Highlands. Journal of Quaternary Science, 25, 581-596. Full text. 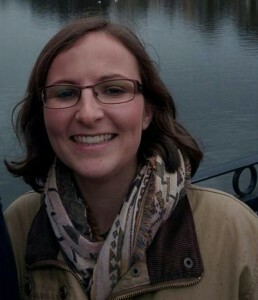 I am a Quaternary Science PhD student at Royal Holloway, University of London and am also enrolled on the London NERC Doctoral Training Partnership. My expertise lies in the use of micro-scale analysis of annually deposited glacial lake sediments to understand changes in past environment and climate during the Late Quaternary. I am also interested in using microscopic volcanic ash layers to independently date and correlate high-resolution palaeoclimate records across the North Atlantic.